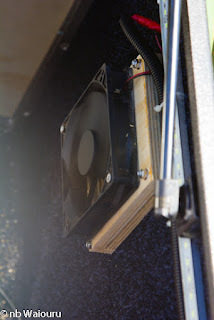 The 12V computer fan has finally been installed in the trailer freezer compartment. In the end I had to remove the freezer in order to drill the holes for the mounting block The fan is wired into the freezer power supply so it will automatically run when the freezer is turned on. With the fan and freezer rumbling away I thought it might be opportune to see what was happening with the solar panels. Freezer on the left and solar panel input on the right. Battery voltage is 13.6V and the freezer is using 4.43amps. The solar is producing 3.02amps which is less than the freezer is using. However the solar meter is measuring the power before the MPPT controller. Note the voltage is 19.55V. A more accurate check on what is happening is the Watts which are shown at the bottom right of both meters. The freezer is using 60.2W and the solar is producing 59W. The battery is already fully charged which leads me to believe to solar can’t produce any additional power as the battery won’t accept it. To test the above theory I started the second Engel fridge. The consumption rose to 77.2W and the solar input to 91.2W. So the solar panels will produce more power if there is a demand. Total solar capacity is 300W which should produce a maximum of approximately 20 amps. At the time of the photo they were producing less than a third of their maximum capacity. This should mean there is plenty of surplus solar power to recharge the 150Ah battery when I’m on a trip.